Published by The Gostwick Press, Willington in 2016, in association with the Friends of Willington Parish Church and Willington Local History Group. 66 pages. ISBN 978-0-9565663-5-5. Price £5. Obtainable via Willington Local History Group. This is the latest in a series of excellent histories of Willington by Gordon Vowles. 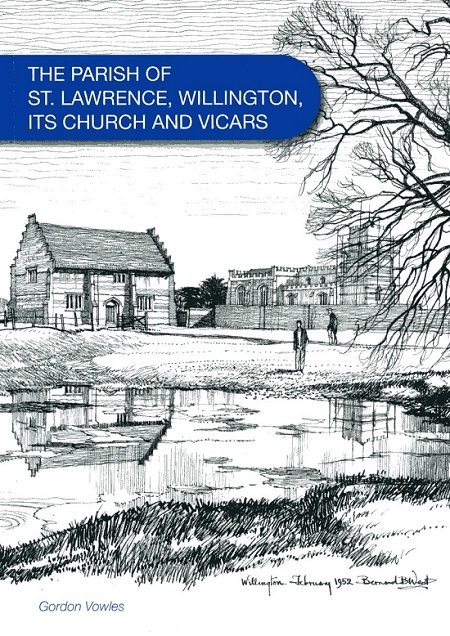 This volume focuses on the parish, the Church of St. Lawrence and Willington’s vicars (from 1229 to 2016). It is well-researched, authoritative though readable, and well-illustrated (with 19 back-and-white figures or photographs). The first chapter deals with the origins of the parish, setting it in its ecclesiatical and social context. This provides a good introduction to the roles of churchwardens, constables and other parish officials, vestry meetings and manorial courts. The second chapter is devoted to the church, exploring its unusual dedication to St. Lawrence (there are only two other parish churches in Bedfordshire dedicated to him). Little survives of the early Medieval church. The present building was comprehensively rebuilt between c.1535 and 1541, funded by Sir John Gostwick. He also commissioned a large new manor house and fine stone outbuildings, including the dovecote and stables (now in the ownership of the National Trust). By the 1870s the church had fallen into disrepair. The 9th Duke of Bedford funded a major, but sympathetic restoration. The remaining five chapters – the majority of the book – are devoted to Willington’s vicars, starting with Nicholas de Wileton in 1229 and concluding with Fiona Gibson, the current incumbent of the combined benefice of Cople, Moggerhanger and Willington. Prominence (rightly) is given to the career of Willington’s vicar and social reformer Augustus Orlebar, who held the office from 1858 until 1912. Orlebar was the subject of an earlier book by the author - The Reverend Augustus Orlebar – which is still available, price £4. This excellent, inexpensive short book is strongly recommended, particularly as Gordon is a member of BAALHS and all proceeds from its sale will go to the Friends of St. Lawrence for the preservation of the church fabric.